Reputation comes is various forms in Destiny but if you prefer PvE modes then Vanguard Rep is what you'll be earning. PvE will also earn you Vanguard Marks which is the currency used to purchase equipment from Vanguard Vendors. If you want to purchase Legendary (purple) weapons then you'll need lots of Reputation. 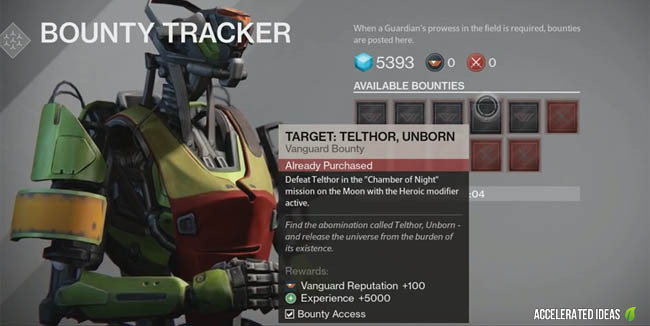 In particular, the Vanguard Vendors in Destiny require Vanguard Rank 2 for Armour and Rank 3 for Weapons. A level cap of 100 Marks per week exists so you'll need to pace yourself over a few weeks to earn enough Marks to purchase the best Legendary weapons. 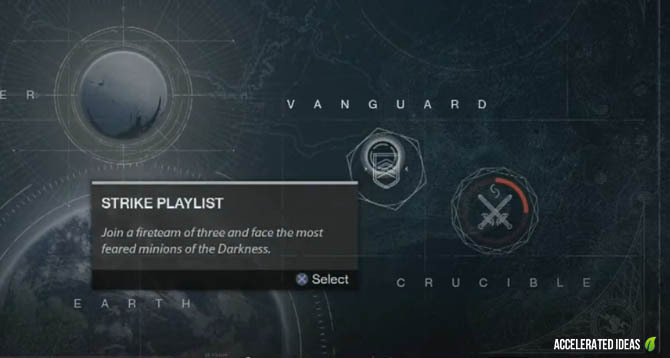 First up, the Strike Playlist will put you in a random Fireteam on a random Strike mission. From these missions you'll earn Rep (and also Marks). A Daily Heroic Story and Weekly Heroic Strike will also earn you bonus Vanguard Rep and Marks. However as the name suggests there's only one of these per day, or one per week in the case of the weekly Heroic. Both of these missions take place on the Hard difficulty and are only suitable to players above Level 20. The weekly strike is appealing because the Rep earned can be well above 100+. It isn't necessary to play Strikes to earn Rep, some people will prefer to grind out Reputation by only completing Bounties and Patrols. You can also earn Rep by trading in Materials such as Spinmetal or Helium Vials by visiting Vendors at the Tower. Important: If you equip a Faction item then you will start earning Faction Rep instead of Vanguard Rep. Therefore, if you're only interested in Vanguard then make sure you unequip the Faction item first. Marks are the currency used to buy new equipment in Destiny. 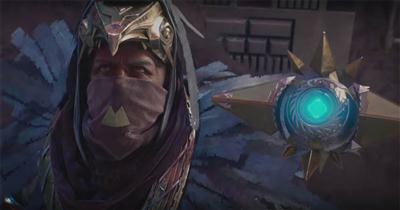 You earn Marks by playing the Strike Playlists and completing Daily and Weekly Heroics. Strikes missions are notoriously difficult, particularly on the Moon, so to acquire Marks takes time and patience. The higher the level the more Marks you earn. A rough rule of thumb is that you'll earn 0-6 Marks (depending on the level of the Strike). Just hover your cursor over the Strike to see the Rewards for each. Important: You can still earn Vanguard Marks even if you have a Faction item equipped. How to check your Rep and Marks? On the Destiny start screen (the one where you see the Planets) you'll see two circles on the RHS. One will be Blue and the other Red. These circles indicate your current Vanguard and Crucible reputation. The blue circle is for Vanguard, I've highlighted it on the image above. A complete circle indicates that you've reached the level cap of 100. This cap resets each week allowing you to earn more Reputation. Where are the Heroic challenges? The daily and weekly Heroic missions are shown on the LHS of the planet view screen. I've highlighted this area on the image above. As you can see, this particular Heroic Story takes place on Earth and it's a Fireteam cooperative mission suitable for Level 20 players. The mission and level changes on a daily basis. The 3 icons on the LHS in order are: bonus for PVP Playlist, Heroic Story mission and Heroic Weekly Strike.